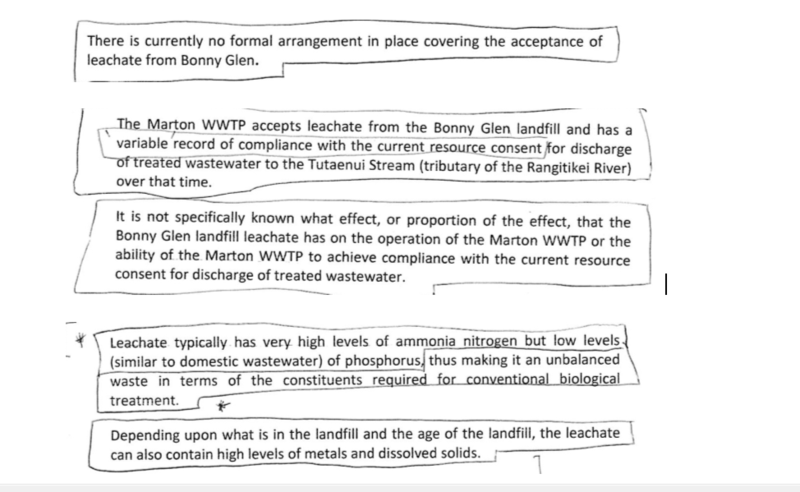 This page features submissions to the consent hearings conducted at Feilding in February 2015. (See ‘Bonny Glen Landfill’ page for a background to the process so far). The page also includes other information and updates that relate to the topic. You can access some of the other submissions yourself in their original form at the Horizons website. To read all articles and updates on Bonny Glen go to ‘categories’ on the left side of the page, or scroll to the bottom of the ‘Bonny Glen Landfill’ page. ‘there can be no economy on a dead planet’. At the end of the submission below here are links to the original compliance and non-compliance reports. Any inserts of photocopied evidence within the submission can be clicked on to enlarge. Whether it falls outside the ‘jurisdiction’ of what the commissioners can consider or not, it remains for me the single most important aspect of these hearings because by allowing Midwest – via a labyrinth of regulatory technicalities – to export the most toxic by-product of their operation off-site ‘legally’, the two councils (as well as central government) are doing very little to protect the interests of ratepayers & the environment (that makes all our lives possible). Interestingly enough, my beef here is not with the bureau but with the bureaucracy – with people’s behaviour and not necessarily the people themselves, for it is partly because we all need money and something to do with our lives that what has happened has been allowed to happen. Either way! … The story begins and ends in my home town of Marton, where I was a member of the Marton Community Committee for slightly more than three years. Nice & democratic right? but… In practice it works somewhat differently. 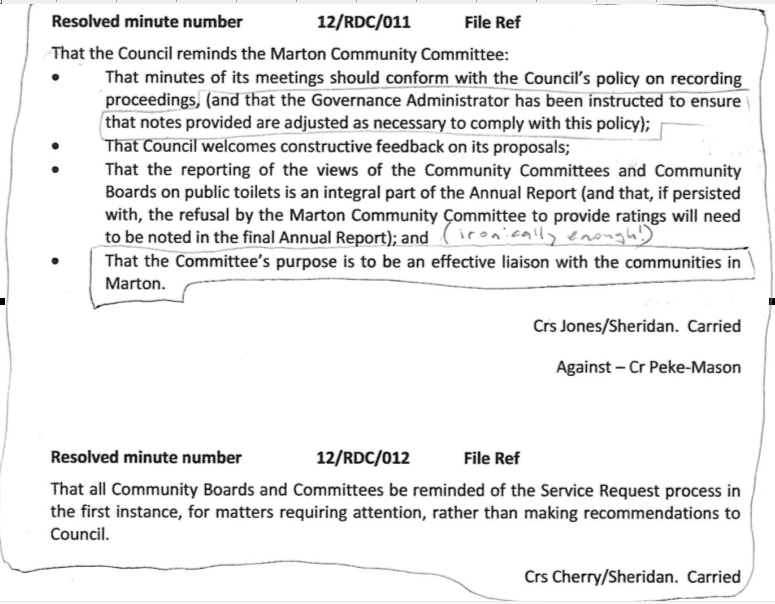 Almost everything we talked about arose not from the community – the people – but instead because the local government act 2002 instructed a well-paid mandarin to literally order us through the order paper to talk about this, that or the other thing. So as you heard – a member of the public came to us because they were concerned about ‘Enviro Waste’ trucks disposing of industrial waste from Bonny Glen down a manhole in ‘the junction’. Ground-up democracy in action right? 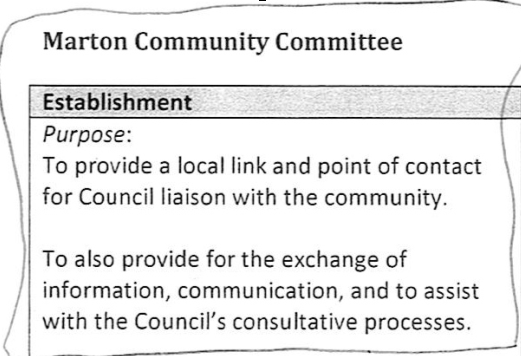 What could be a relatively simple & democratic process – providing straight-forward answers to straight-forward questions – became an opportunity for Council to tell us off about small-scale procedural matters, with only one councillor voting against the motion, to her eternal credit. How more ‘specific’ and ‘clear’ could we have been with our recommendations? Do the Council have something to hide? 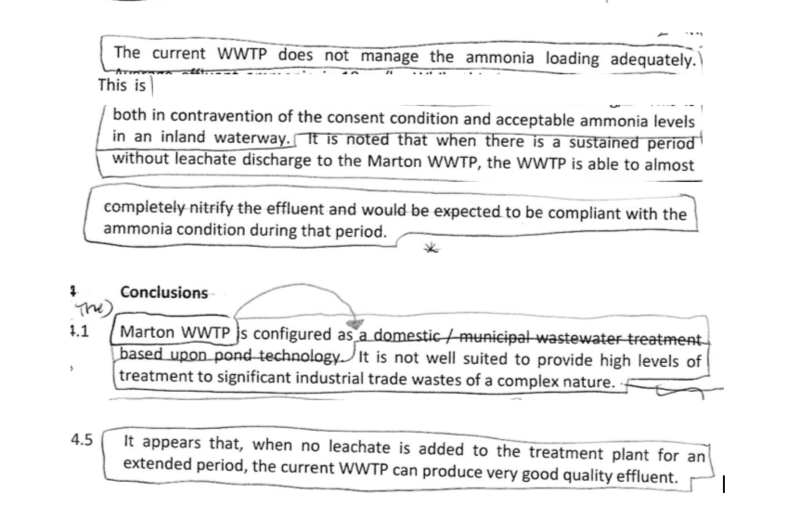 And… as you may have noticed, ‘legitimately’ or let’s say ‘legitimate’ was the word then-councillor Andy Watson used to describe the Council’s ‘gentleman’s agreement’ with Midwest to dispose of the leachate at the treatment plant. Which begs the question: what did he mean by ‘legitimate’? 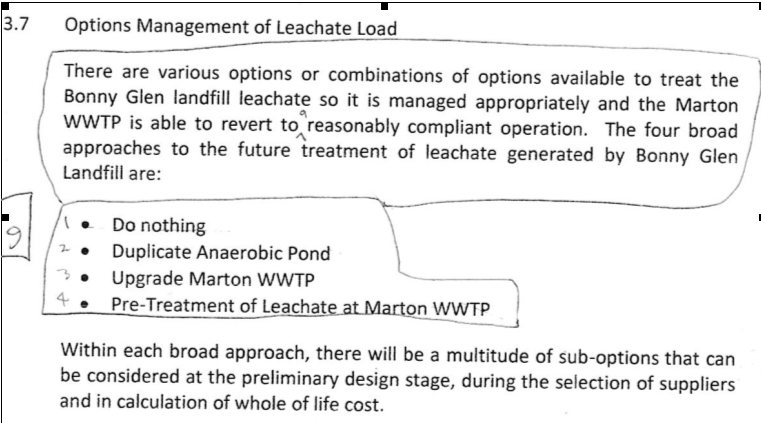 According to Council’s own report, the leachate and the ongoing non-compliance of the treatment plant are intimately connected. Is this what Andy meant by ‘legitimate’? Please continue to monitor and report on results in the months of July, October, January, and April each year. To me that implies that 4 reports are required each year (I might be wrong on this one – can anyone please clarify this for me?). I only received sixteen. What happened to the other twenty? 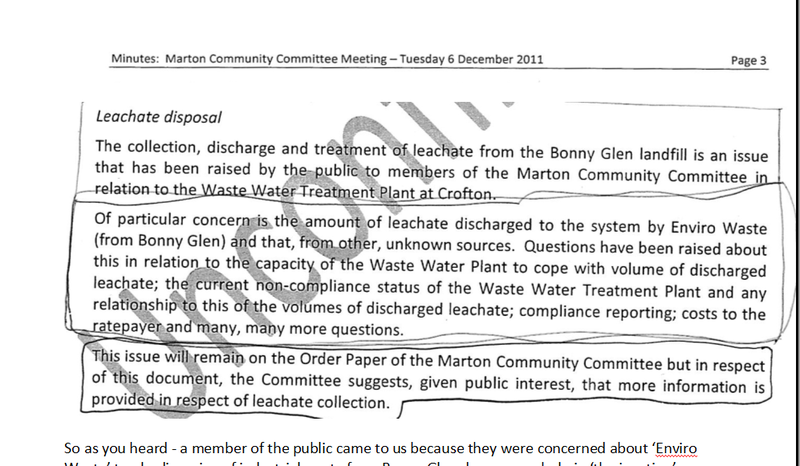 Why would Horizons withhold information if indeed the leachate is being dumped ‘legitimately’? One report from 2008 et cetera, et cetera. The breaches of the ammonia limits in September 2007, November 2007, December 2007 and March 2008 are significant non compliances. Please investigate the reasons for the breaches of the consent conditions and implement procedures to prevent recurrences. These concentrations have been shown to be directly toxic to aquatic life. The Consent Holder shall conduct an in stream biota survey…once every 3 years from the date of issue of this consent, for the duration of the consent. The last report that we have on our files is from 2002, please forward copies of the more recent reports to us. And what of these more recent reports? It wasn’t until May 2013 that a non compliance was issued by Horizons, because the compliance report sent in February 2012 highlighted the need for the 2012 survey. 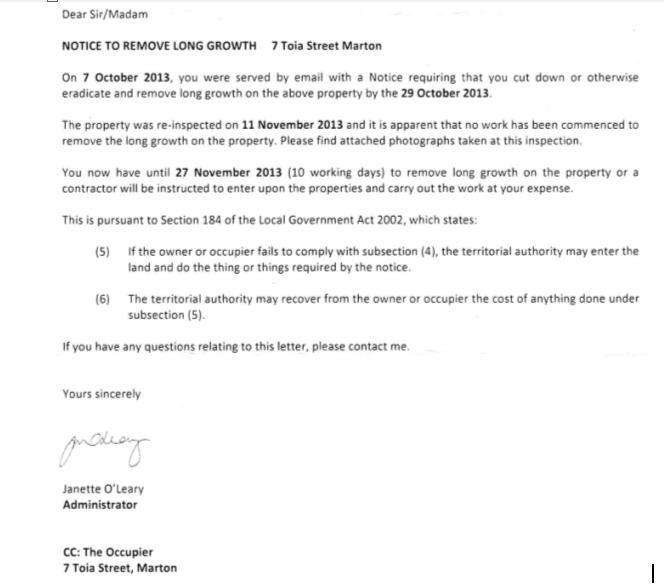 Strangely enough, on the 22nd of November horizons reported that A macroinvertebrate report [was] due in 2012. Discussions with RDC have indicated that a… report has been commissioned. Please forward a copy of the… report as soon as it has been completed. Strangely enough, in order to comply with the consent, all that needs to happen is the report itself. The state of the stream is seemingly irrelevant when it comes to the governmental authority with the responsibility of protecting the environment. Either way, Horizons has had an absolute shocker by allowing RDC to continue to pollute with no penalties for non-compliance beyond the words ‘significant non-compliance’ appearing on a report that virtually no-one ever sees. Who picks up the tab as a result of both Horizons & RDC’s incompetence and irresponsibility? We do. 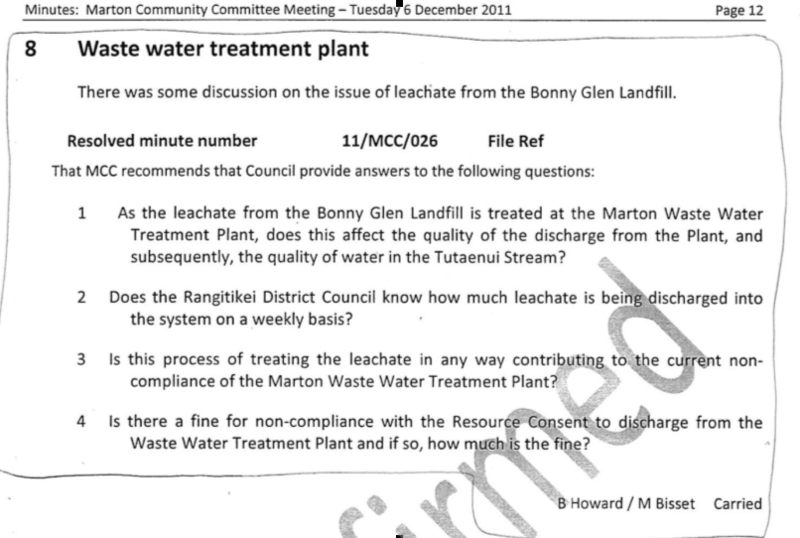 Who pays the price when RDC ‘legitimately’ take leachate from the Bonny Glen dump and Horizons fails to hold them to account for polluting the Tutaenui stream? Not just us, but future generations. Also pay for the consequences of the treatment plant (overall, for the most part) failing its consents for the last nine years. How is that fair? How is that just? How is that democratic & how are they able to get away with it? Where do they get off consciously deceiving and then reprimanding the very community organisation that was only wanting answers on behalf of the community when we first raised the issue back in 2011? Because the rules are set up to allow them to, that’s why. And who makes up these rules that we’re all compelled to abide by? Have we as tax and ratepayers ever been asked to vote for or against these rules? 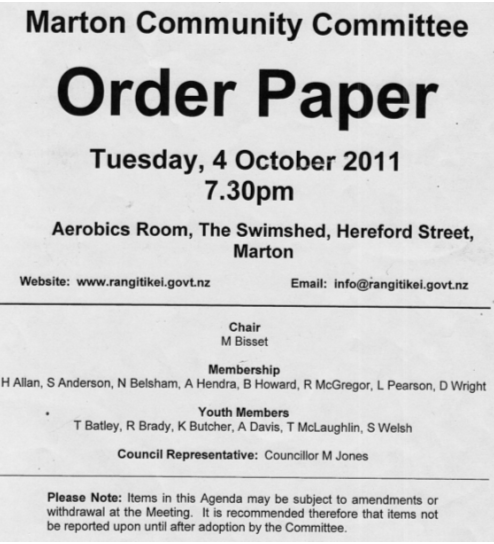 This is partly why I accuse Horizons and the Rangitikei District Council of a ‘conflict of interest’. The two ‘interests’ in question being (generally speaking) 1. Doing their jobs according to the undemocratically conceived rules of the government & the economy and 2. Protecting the environment. Anyone who works for the ‘public service’ in this country gets paid 36% better money than the average worker and 15% of ‘public servants’ are on six figure salaries. Not just that, but their income is tied to annual inflation so that no matter what happens in the economy, anyone who works for central or local government is immune from the negative side-effects of our economic system. So…Irrespective of what they do and why they do it, they still get paid above average money for their troubles. The trouble though, is that we live on a planet with finite resources & the rules around ‘natural growth’ are not the same as ‘economic growth’. As human beings we grow until reaching physical maturity and then we stop growing and we all understand that that’s natural and normal right? Can you imagine the problems we’d have if our bodies grew according to the rules of the economy? How big would our clothes have to be? Our houses? Our cars? I’m thankful for these natural limits. What I’m not thankful for are the government & the economy’s impositions on my everyday life and the threat they both pose to our collective future. Continuous growth on a finite planet is insane, and when this growth is not just officially sanctioned but demanded by our governing institutions we have a serious problem if we want to ensure that our children our able to raise their children in a healthy & safe environment. At some stage, something’s got to give. At this current stage in time, it’s Ratepayers who are giving time and time again. It’s ratepayers who have no choice but to pay Horizons and RDC to poison our rivers & endanger our future. But we do have a choice whether to speak up or remain silent – unlike the environment that makes our lives possible. We need to choose as there is no middle ground between the way our government & economy currently operate and the natural limits of the environment that are more difficult to influence and control. “there is no economy on a dead planet”. Note: due to some earlier technical difficulties I had to copy & paste these into the web page. Apologies as some page formatting has not translated too well. They are now uploaded below as PDFs. Click on the links below to read. NOTE: These are uploaded singly and not as groups as above. They are now all uploaded. You may need to download Adobe Reader from the Adobe website to read them (it is free). It remains to request the report due for late 2014. Check back periodically for updates. NOTE: Please feel free to comment, or contact me to comment via the contact page. 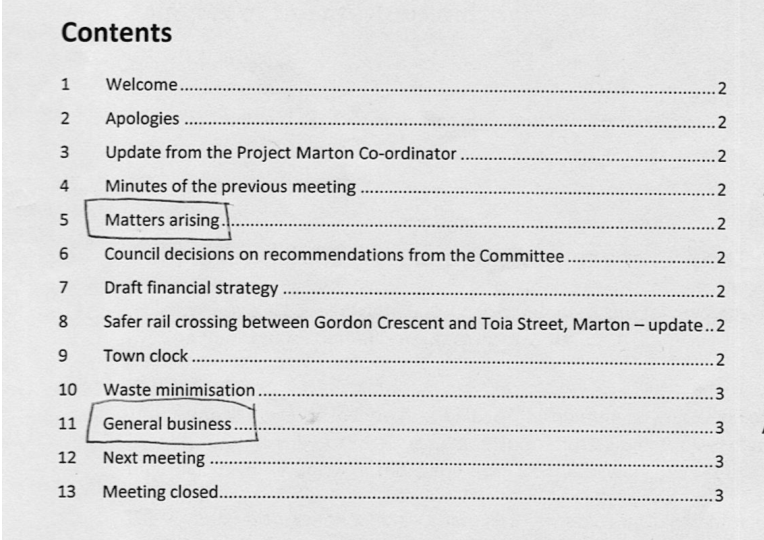 To follow up on these issues it remains for the public to approach the RDC which is possible through the Marton Community Committee which meets monthly on a Wednesday (details and dates on the RDC website). With enough persistence by enough people change must surely come about. As to the consents … personally I think it’s unlikely they’ll be denied, given the preparation & expense made by Midwest. I feel very much for those who live near the landfill. Mr Mullinger has said that fresh refuse has a ‘sweet odour’ … I’m sure that the folks living next door don’t describe it as sweet. I’ve noted in the compliance reports reference to there being no complaints of odour … perhaps it is the squeaky wheel principle that needs to be applied.